I wrote a tiny program using the newly learned Excel VBA to illustrate the relation between population and sample in statistics. This program generates a population of 30 repeatable random integers from 1 to 100. The user might then specify a sample size, say, 8, and the program would pick 8 numbers from the population and put them into the sample area. 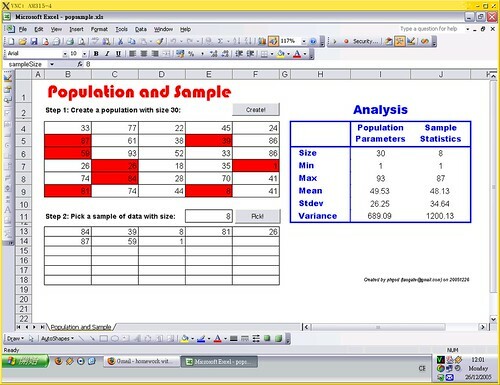 Excel would calculate the population parameters and sample statistics respectively. This program should help the students understand the effect of sample size on these statistical quantities. I have put the program into public domain. Interested readers please feel free to download the program for your use, modification or study.